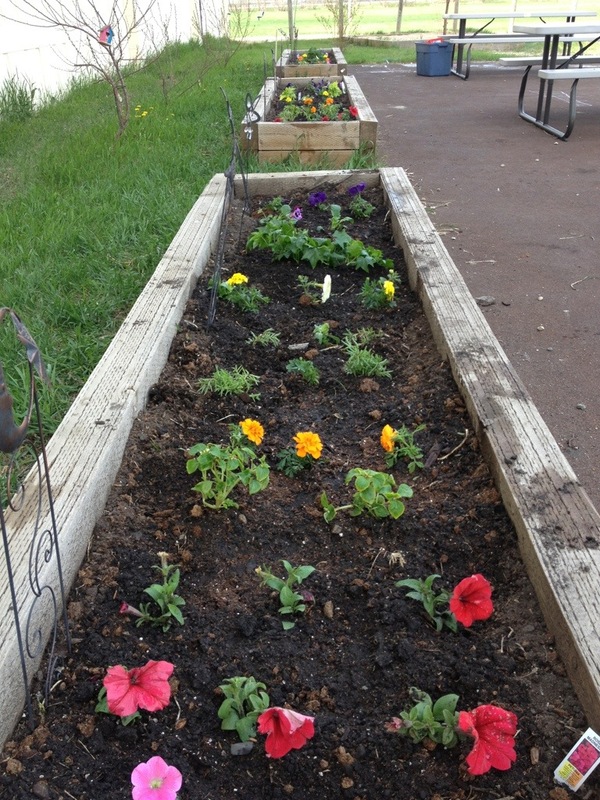 This week at the Small Lot of HOPE the Garden Club planted our “rainbow garden”. On a recent trip to the Country Garden Greenhouse, here in Carlyle, the children decided to plant the beds with a variety of different coloured plants in the order of a rainbow. Unfortunately the plants had to wait at the green house for two whole weeks before it was warm enough for us to plant them! The children choses firy petunias, bright marigolds, zinnia, Portulaca, pansies and Ivy and placed them in each of our three garden beds according to colour. Currently the flowers look a little small, but we gave our soil a good boost with some organic bone meal and a good drink of water. These little babies will be spreading out in no time flat! Remember our little rainbow garden?